This is informal with the family. Patricia Mary DeCaire, 74, of Traverse City, died Thursday, January 26, 2017. She was born on April 3, 1942 the daughter of James and Luella Hammond Flanagan. Pat was one of the most caring, loving, helpful grandmas/mothers you could ever want. She was also a really hard worker and did everything she could to help others. She has been a fighter her whole life. Pat endured open heart surgery, having a pacemaker and a pig's valve. She never gave up, even in the hardest of times. She always wanted the best for herself and others. Growing up, she worked at a bump shop and had multiple farms. Pat loved working outside, cutting wood and working in the garden. Granny was a devout Catholic and loved going to church. She also enjoyed cooking and baking from scratch, of which she passed onto her children and grandchildren. Her favorite drinks were 7UP, Vernors, Kool-Aid and homemade lemonade. Granny outlived her mother, father, brother and 3 husbands. Granny is survived by her companion, Bill Randall, 5 children, 14 grandchildren and 2 great grandchildren. An informal gathering will be held 3pm to 6pm Saturday, February 4, 2017 at Life Story Funeral Home, Traverse City. 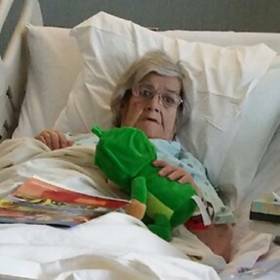 Memorial Contributions may be made to Patricia's Go Fund Me to help with expenses at https://www.gofundme.com/pat-granny-decaire-burial-fund. Please visit www.lifestorytc.com to sign the guest book and share your thoughts and memories with the family.